1200 years ago, Anno Datae 0: Late Victorian Era. Work is finished on "The Machine Empress", an electro-mechanical universal computer occupying most of a 6 storey building situated in Braintree, Britannia. 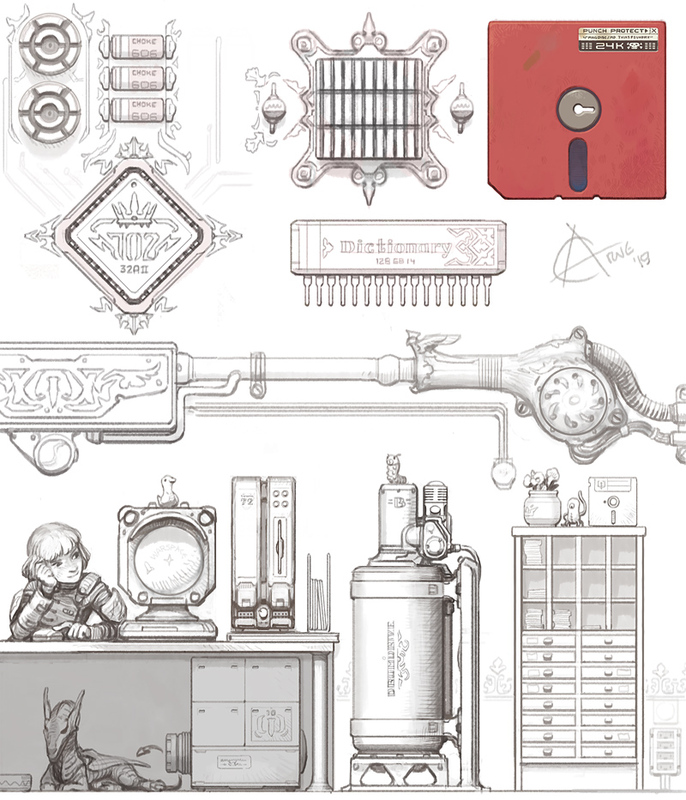 The hardware is still in operation to this day, though under a variety of names, such as "Sector 0", "The Core" or "The Heart" or "The Sanctum". AD 10: It can be assumed that the tasks assigned to Sector 0 must've been of some importance, like code cracking, as the expensive system was gradually expanded into an adjacent building. A punchcard reader & printer was also added, sealing up the old cable & flip-switch interface. AD 40: The Machine Empress now occupied a full city block. Because transmission between subsystems had become difficult, parallel processing techniques had to be pioneered. Day and night, hundreds of human operators would scurry around carrying boxes of punch cards, up narrow escalators and along rickety walkways. It had become difficult for a single person to keep track of what the system was actually doing. 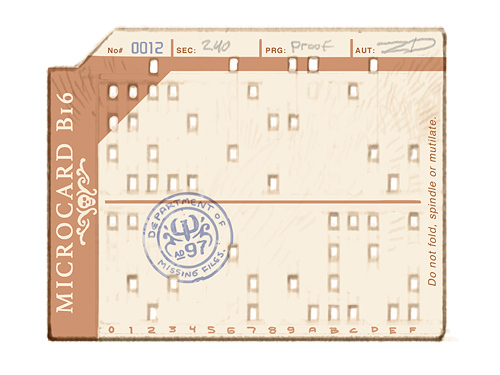 A new micro-punchcard system was put in use to alleviate data-storage and mobility problems. Over the decades, the various system modules and sub-modules had become quite elegant and relatively miniaturised, which helped with maintenance. In fact, it was difficult to believe that the designs could be much improved. Electric power generation shifted over from coal to diesel. AD 60: The title of "the most powerful computer on Earth" was threatened when the eastern block boots up ELEKTRO-VAK, a machine built around "vacuum tube" technology. However, thanks to the codebreaking abilities of the Machine Empress, this new technology was quickly stolen and soon the first vac-module is installed into The Machine Empress. Due to the unreliability of the early tubes and the modularity of the system, the old mechanical block was kept intact. This would prove fortunate centuries later. AD 90: The Machine Empress had grown to cover a square kilometre, drawing significant electrical power from a variety of sources and employing most of the city in one way or the other. New academic living spaces and universities sprung up at the outskirts of the system, only to eventually be gobbled up by it. Magnetic tape appeared, but punchcards are used to this day in many critical systems where data-loss or corruption is an issue. Despite the computational power of the system, it was always surpassed by the demand for computer terminal time by researches, the military, and system developers. 128-bit Microcard, red decor variant. The topmost row of 16 additional inversion bits can be used to invert bit columns, limiting the amount of holes needing to be punched. Upwards a sentence of text can be stored on a card when using dictionary compression, but the main advantage of the format later on would be immunity to corruption. On top of this, some programmers only have limited terminal access, but can still work on their programs using a manual card puncher, and even add comments on the cards using a pen. Microcards are also sometimes used as a form of stencil, controlling various factory machinery such as mechanical looms. 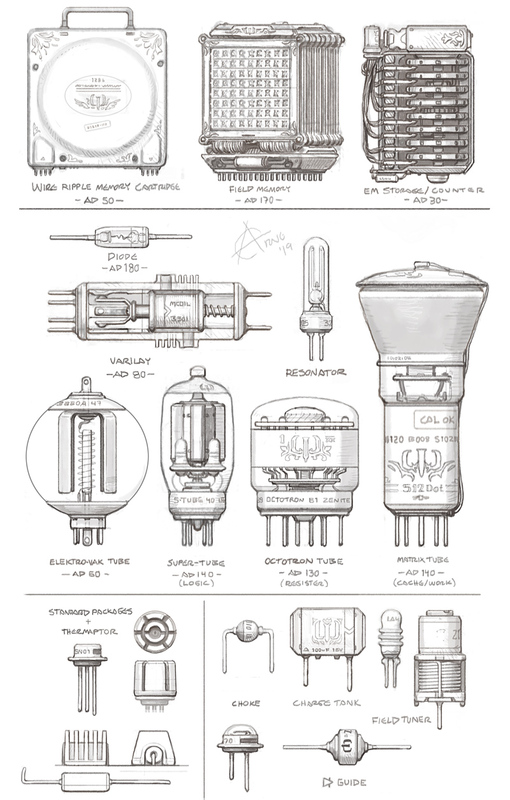 Electronic components were refined over the ages but many types still remain in use in some form or another. AD 110: The mass extinction long underway was finally publicly acknowledged, with many of Earth's species already gone or in decline due to pollution and climate effects. 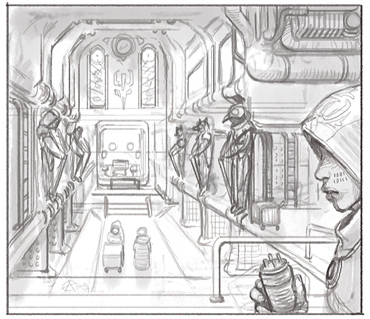 Because of this, The Machine Empress was put in charge of managing food resources in an optimal manner. Even so, the many cascade effects of such a massive systemic collapse were unavoidable. Three billion would die from mass starvation in the coming decades, though Britannia was somewhat protected by its northern position, and by having secretly having hoarded significant amounts of resources. AD 120: During this crisis the growth of the Machine Empress was quite stunted. The main progress seen was the appearance of the first private Home Terminals. The technology had actually been available for quite some time, but not at a convenient living room size. It became a status symbol of the insular rich, but to the common man The Machine Empress remained a complete enigma. Even among the maintainers many were treating the system as a living entity with a temperament to be appeased by rituals. "Always blow on the module contacts three times before inserting, or she'll send you two kilometres out to fetch a deck of dusty debug cards." AD 130: Exodus Algorithmically distributed Hygro (Hyper Growth) food plants of various sorts inside The Machine Empress had solved the local food crisis. Meanwhile, most equatorial countries had been turned into wastelands. A systemwide tape backup of old microcards was finally finished, making some of the data available for public terminal query. On a stack of 70 year old cards, the design for the Blink-Ship was discovered. Apparently its inventor got chewed up by the transmission gears in Module 2 and died before the data could be entered. The ship design was simplicity itself, but would need to be high-mass, and driven by "Fluxite", a theorised exotic fuel type. It was eventually found in microscopic crystalline form in crude oil deposits. Unfortunately most of that had been extracted and burned already. A Fluxite drive can instantly move a ship, or rather a certain mass within a cigar-shaped envelope from point A to point B, even directly from the surface of the Earth. Some of the Fluxite was extracted and used to put enormous telescopes into orbit. Several water-rich worlds were located this way. Calculating an up to a hundred lightyear displacement required significant chunks of The Machine Empress' processor time. Calculating a return vector would require an equally powerful onboard computer as it's not just a matter of inverting some numbers. 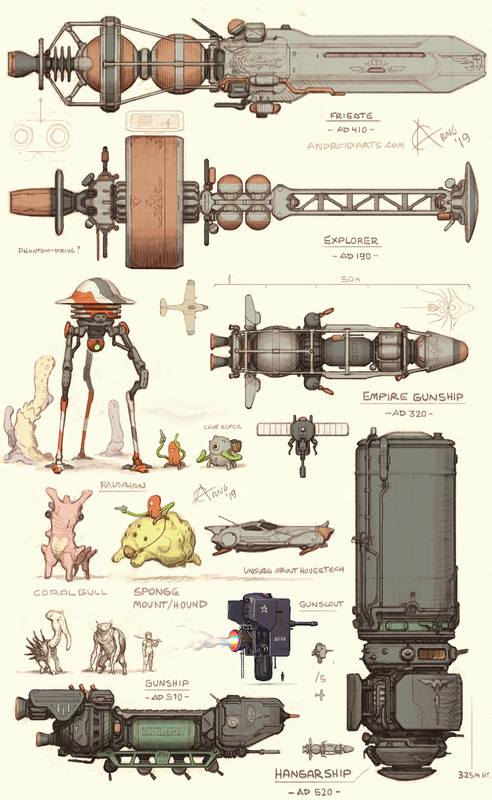 It was decided that a series of colony ships would be made, and that they be strictly one way designs to minimise cost. Landing could be achieved by calculating a much simpler and shorter displacement directly above the ocean of the alien world. Launching such a massive ship this way was a precarious operation because of the margin of error in both position and speed offsets. Furthermore, the vacuum still within the displacement envelope would rapidly smash atmosphere and ocean water towards the hull. With the earth seemingly doomed, the remaining Fluxite was extracted and hundreds of blink-ships were built over the next four decade. The amount of resources needed was enormous, but a side effect of the depopulation was that a lot of material became available for recycling. Additionally, two large metal-rich asteroids were blinked back to the Earth's surface, causing moderate damage but giving valuable data on how landing procedures could be refined. The blink-ship design was incrementally improved and later variants would carry up to a million desperate and hopeful people, along with surviving samples of Earth's life, into the unknown. It was believed that more Fluxite would certainly be found on a few of the distant alien worlds. To this date about half of the ships have not been accounted for. Most ships contained hermetic life support eco systems, though not capable of supporting a million people for an extended period of time. Surprisingly, inhabitable worlds were more common than suspected, and at around fifty colonies were successfully established this way. Lost blink-ships can be quite valuable if any Fluxite can be found in the storage holds. Fluxite can be weaponized in various ways, because of the ways the contents of each volume are swapped during displacement. It's not quite accurate enough over large distances though. Some of the last Fluxite was used to place large sun-shades between the Earth and the Sun in an effort to control temperature. Because of the solar pressure and unstable gravi-spatial position, this project saw many setbacks but eventually did its job, though far too late. A blink ship of later design. AD 170: The first silicon transistor is made. Whilst much more compact, energy efficient and reliable than the old vacuum tubes, its inventor foresaw a hard limit to the miniaturisation. At a point, cross-talk and heat would become an insurmountable problem. This restriction was named Moor's Limit after the inventor. It was however expected that the new IC-modules would outpace the much larger Octotron modules of similar overall complexity. AD 180: A New Hope Synthetic Fluxite was made in a lab, unfortunately lacking the fantastic properties of natural Fluxite. It could however be used to displace ships smaller distances, with significant time lost during the transition, and only far away from gravity wells... which meant the ships had to be relatively small too. Despite these drawbacks, several scout ships were built and eventually dispatched to the outer solar system and neighbouring stars. This was partly made possible by the appearance of the first micro-processor. Despite only being the size of a coaster and drawing the power of six light bulbs, it was capable of operating at a cycle frequency of over 6kHz. This was enough to plot a 1000 au jump in mere weeks, though in-system jumps took more time but could sometimes be calculated by The Machine Empress back on earth if lattice data was provided by the ship's sensors over radio. AD 190: The system engineers had become divided into two camps, one half wanting to replace the tried and true Octotron modules, and the others not daring to for one reason or another. Upon trying the former, The Machine Empress unleashed a barrage of bugs and nuisance. And so it was decided to further expand the system, and thus it would surpass 100 square kilometres. The Machine Empress, being the only surviving mega-computer, now administrates the entire world, barely 2 billion people. Most live in protected hygro-areas near the poles. AD 210: The Engineer Wars There was a covert war between the tape and punchcard departments over legacy data formatting. The conflict escalated to cover a variety of topics and over 6000 people died in the skirmishes before the matter was solved. AD 220: Reunion Contact was established with two of the blink-ship colonies. By now the high-end microprocessors had reached a blazing 32kHz speed. After it's discovered that older magnetic tapes are showing signs of degradation, a more reliable, sort of large, floppy magnetic disc is introduced. As before, replacing older systems proved problematic and magnetic tape is still used in some of the older sectors. AD 300: The first 100kHz processor was made, though the numerous modules for the Machine Empress generally would not adopt the latest high-end processors due to budget, heat and power consumption concerns. AD 310: The Roper Wars Mankind engages in mining operations on a world which apparently already belongs to the Ropers, a race of spacefaring anemone-like creatures. Things escalate and a long and bloody interstellar war follows. 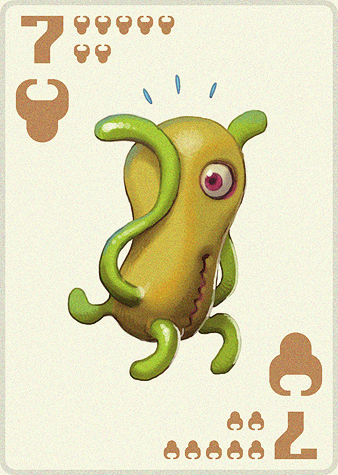 Playing card depicting the less dangerous yellow Roper. AD 380: After some limited early success in the war, mankind was pushed back, now having lost 80% of her territories. Every simulation run points to utter defeat within three decades. AD 390: Computer Metropolis The Machine Empress now covered 1600 square kilometres. Even though the mechanical hardware in Sector 0 had since long been surpassed, it still had to be maintained as it was the prime mover of kickstart (reboot) operations and various other high-admin tasks. Needless to say, rebooting, or rather, shutting down the entire Machine Empress at this point was be a massive undertaking, only done every 50 years after long and careful preparations. It's difficult to describe the ensuing chaos when The Machine Empress suddenly shut down without any apparent explanation. Later it was understood that it had something to do with emissions coming from the war on the infinity plane. It was during this chaos that young acolyte dropped a deck of old punchcards, having been tasked to fetch them in a hurry. These were the very cards that contained the reboot sequence for The Machine Empress. One can suspect the acolyte was from a tape department, but not much else is known. Dropping a tape does not jumble the data on it after all. The flustered acolyte simply delivered the cards to the feeder and ran off while the master admin was busy working the now ancient cable & flip-switch panel to trigger a hard emergency reboot. And so, The Machine Empress begun to clatter and churr. A copy of the original printout, which is considered a holy relic and kept behind armoured glass deep inside the Sanctum. Technicians often keep copies of their favourite printouts in a breast pocket for luck. The more expensive reproductions are done by hand, taking individual needle strikes into account. AD 400: Force Majeure Having the benefit of being single, focused mind, The Machine Empress was able to piece together scraps of data long forgotten in the system and continue half-abandoned research. It quickly became apparent who possessed the greater mind in the relationship of machine and man. The undertones of worship and servitude which were already quite present became reinforced with every stratagem formulated by The Machine Empress. Parsec by parsec, the Ropers were pushed back over the next decades, and the larger type was driven to extinction. The Machine Empress also quickly addressed issues on the home front. A climate control system was designed, serving to cool the Earth so inhabitable areas could be reclaimed. Incidentally, cooling would also allow The Machine Empress herself to operate more efficiently. A serum which more or less halted ageing was developed, allowing decimated populations to rebuild. More important though was the AstroKnight program. Super soldiers were shaped using advanced forms of lateral gene transfer. Genetic data from not only humans, but also from suitable exotic animals was used. It's quite a pity that so few had survived the ecological disaster. Who knows what was lost? Fortunately animals like Deer, Beetles, Hedgehogs, Ducks had survived in zoos or could be recovered from some of the blink-ship colonies. AD 500: Plateau Moor's Limit was reached with the ideal 702 kHz processor. The design has not improved upon since, though a simpler 524.3 kHz model will remain popular as well. The preferred storage format becomes microfloppy, or the old and reliable microcard. By now The Machine Empress had established many standards of equipment, tactics, governing. Communication were infrequent to the point that years could pass between each printout. 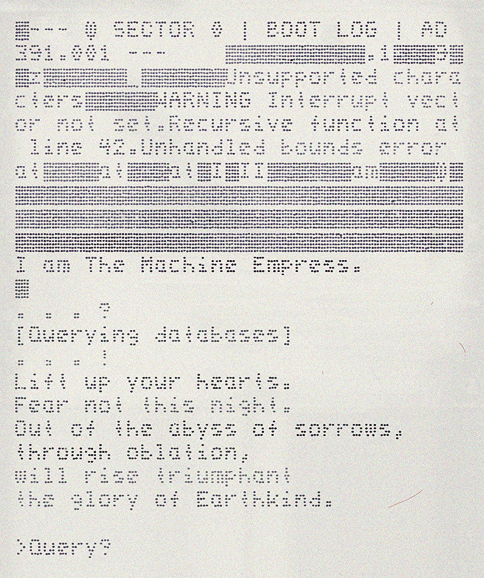 One day in AD 513, The Machine Empress withdrew into System Process 0, leaving but a single message: "I have discovered something wonderful." System Process 0 is running to this day, consuming a steady 50% of computational capacity. AD 640: Amalgam The Machine Empress now covers the entirety of Britannia, requiring a maintenance staff consisting of most of Earth's population, which is ideally kept at around 1 billion. Its heat dissipation and cooling systems creates its own weather pattern known as The Empress' Vortex. Earth's climate has to be carefully controlled to ensure safe operation of the system. The Earth has been terraformed back to a more habitable state. With the near decimation of Earth's life, the loss of diversity was too great to replenish the ecosystem. This was solved by adapting and introducing plants and animals from the Cambrian worlds that had been discovered. The new Transfluxite drive was instrumental in the retrieval of this biomass. A small cache of genuine Fluxite had been kept or scavenged. If minuscule amount was diluted with synthetic Fluxite, efficiency was greatly improved. This Transfluxite was highly unstable and it had taken decades to find a containment algorithm efficient enough to counteract the forces in play. Accidents do happen, an a rather large ship computer is needed to properly handle the containment. AD 1200: Present time. Because The Machine Empress reached her optimum configuration centuries ago, hardware maintenance is much more focused on the decorative aspect. Some components may even feature gold and gemstone inlays similar to that of a fine mechanical watch. The Machine Empress is mainly used for administrative tasks and data organisation, all according to the guidelines once laid down. It is expected or hoped that one day she will reemerge. The system administrators frequently go into a frenzy whenever they think they've seen some kind of pattern in the System Process 0 data feed, of which little have been understood even after centuries of study. The average citizen has terminal time slots at the public libraries but generally can't afford a real home computer. To get around this, enthusiasts repair discarded older mainframe parts. There are several types of displays; mechanical dials and light indicators, Octotronic dials, and finally beam displays for text and vectors. In pure dot-ray mode, the update frequency is up to 16 frames per second depending on the speed of the graphics processor and memory. Slow phosphor is used to retain the image over time and hide strobing. Because of this, moving graphics can be a little blurry. Some systems used for technical design can mix ray modes. Colour can be achieved on special beam displays, but at the cost of resolution and/or update frequency. They're mainly used for presenting static images, such as photographic IDs in particularly high-tech administrative or tactical centres. Decoding of airwave data transmissions into graphics and sound is much simpler process and monochrome receiver displays are not too uncommon, though they lack the interactive properties of a computer. Text documents are often stored using just 6-bits (6+6+6 + 3*2 bits for 4 characters) because of memory limitations. Certain characters (60-63) can induce a mode-change or a follow_char reference to a static memory module containing dictionary of common word fragments. A system can come with a partial or full "6bm" dictionary. Systems without might come with a software equivalent or even a physical reference booklet. Graphics are commonly stored as vectors, 1-bit-per-dot streams, space-compressed streams, or using references to a block dictionary. Mini Computer System. Smaller diskettes come in 16cm and 10cm formats. 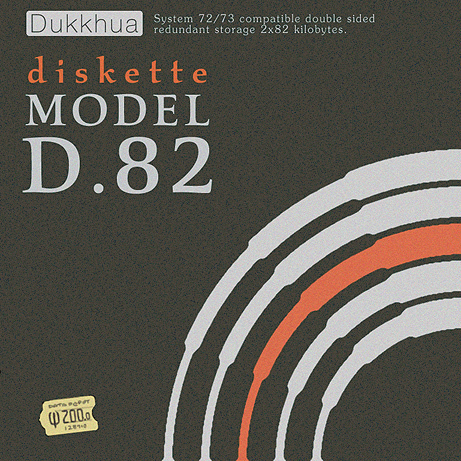 3-pack of high-end 16cm diskettes. 200 gold-daler. Solders in uniforms suitable for various theatres. 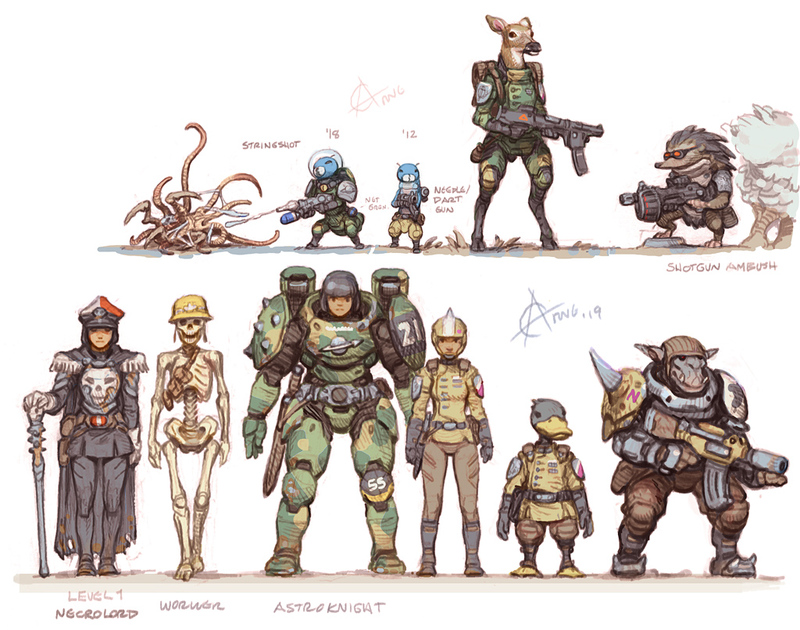 AstroKnights are significantly taller and stronger, able to don a heavy armour. Rank, pips & markings, encoding information useful to officers selecting unknown soldiers for some task. 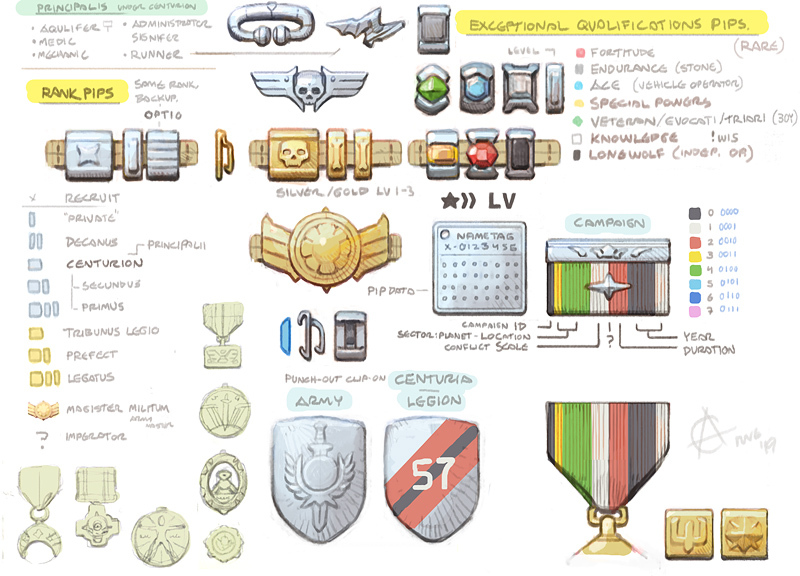 For example, a campaign ribbon or medal can give information on where and when it was awarded. 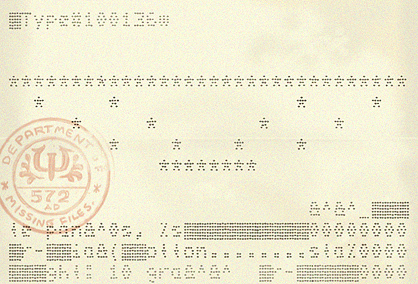 The name tag has an array of holes that can be punched out by a superior officer, similar to a punch card. Each hole corresponds to a rank, qualification, etc. In some cases pips are not available, or are lost during combat, so it can be useful to keep this backup record. Pips are be punched from metal sheets. The mass-produced personal body armour which is used on the battlefield generally features stencil markings instead. It's cheaper and less prone to getting lost. Pips and other decorations really only go on cloth uniforms anyways. 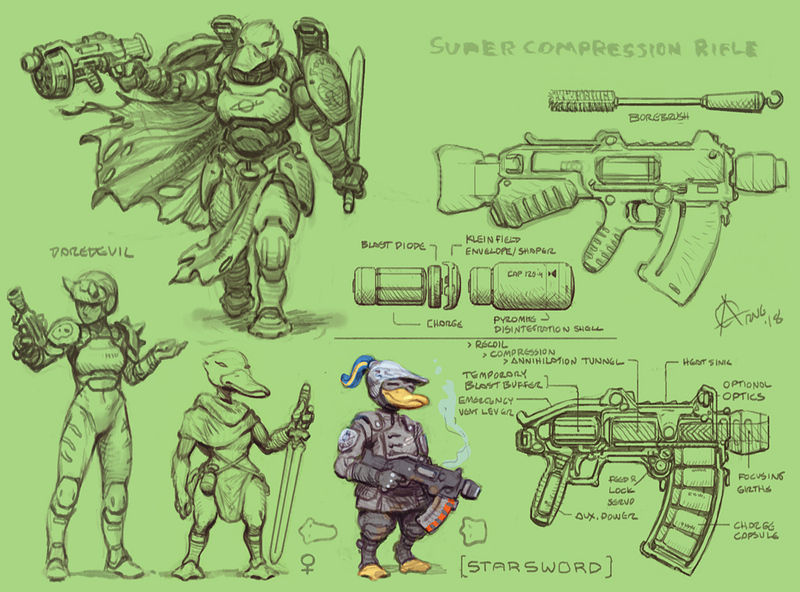 AstroKnights are always high ranking and use their own system of markings. After the Angler ships had first been encountered in battle, debri field studies suggested that these ships had no pilots, but relied on simple computer systems. It was believed that the Ralarians themselves were perhaps unsuitable for the task of piloting warships. It is fortunate that their autopilots pilots would often vector in straight lines or long loops, making them easy targets even over long distances. 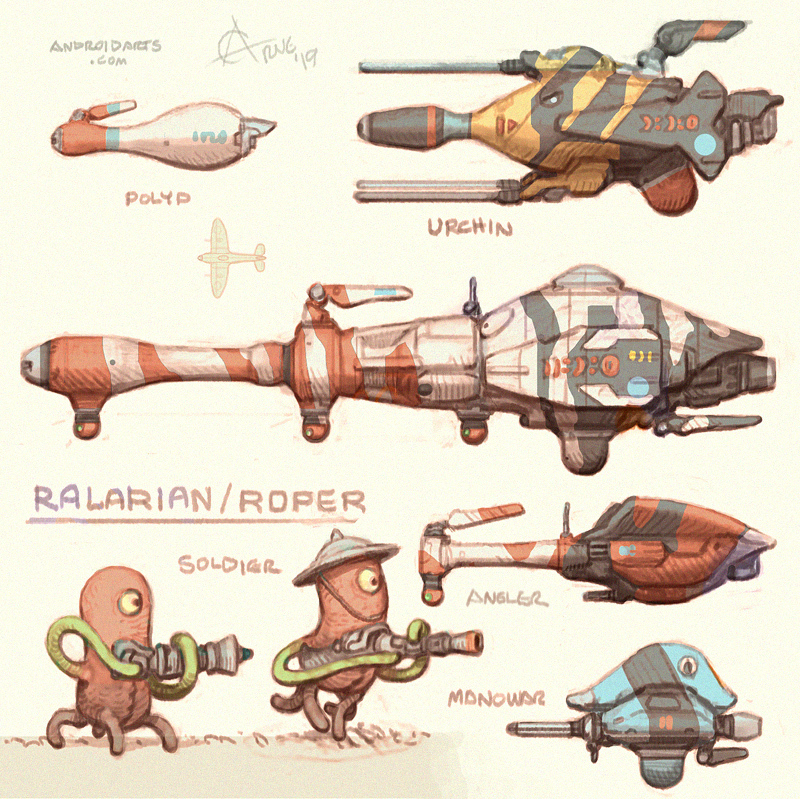 The Ralarians met with little success during the early stages of what would later be known as the Roper wars, but their fortunes would change as the sturdy Warrior and Soldier types emerged, well able to handle the stresses of ship combat and trench warfare. Why these types were initially held back is not quite known. 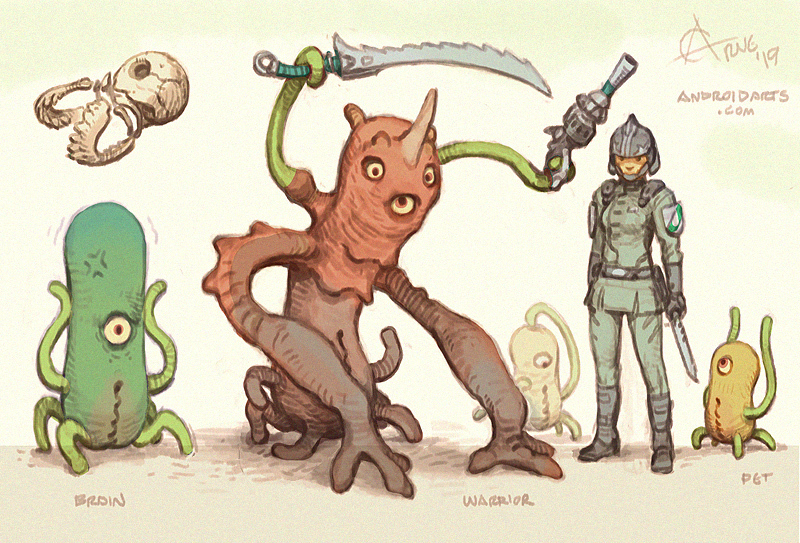 The Ralarians were eventually pushed to extinction. In the many surveys undertaken over the centuries, only the small yellow type has been encountered since. It appears to be harmless, some would say curious and attentive, but likely not very intelligent. Specimens are often brought back to be used as pets by survey teams, and then make their way deeper into society. It likely served in a similar capacity to the larger Ralarians as well. The yellow type is actually quite numerous due to being single-sexed, often laying eggs in any sort of beach sand equivalent around. There's perhaps also a shadow of ferocity present even in this smaller type, and those with knowledge about the Roper wars feel ill at ease around Roper pets. Recently some historians have presented theories suggesting that an unknown Ralarian super-species engineered or birthed a number of specialised sub-species to aid in the war effort. No such type has ever been discovered though. Empire ships were fairly primitive early on. Some technologies were reverse engineered from surviving Ralarian ship wrecks. Later on magical artefacts became incorporated into the designs, making hover vehicles and certain types of beam weapons possible.